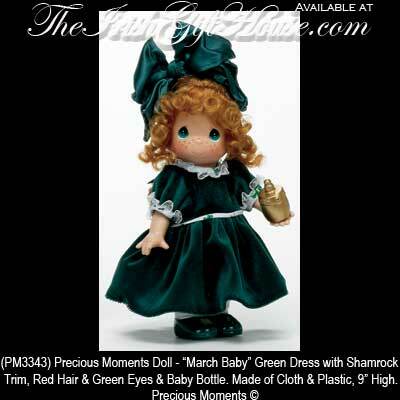 This Irish doll features shamrock trim on her green dress and she is holding a baby bottle. The baby girl Irish doll has red hair along with green eyes and is enhanced with jointed limbs. The Precious Moments doll is made of cloth and plastic and stands 9" tall. The lass is gift boxed with a shamrock history card that is complements of The Irish Gift House.